Great Holiday Books from Sterling Publishing! I was so excited to receive a package of holiday books from Sterling. While I don't review a tremendous amount of children's books, that's something I hope to change a little bit. Not because I'm pregnant, (ha!!!) but because I think picture books have more crossover appeal than we give them credit for and also I have a little bit of expertise in knowing what books make good tools for learning how to read. In this case, I simply love Christmas and enjoy books for all ages. 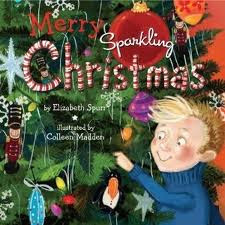 A Merry Sparkling Christmas by Elizabeth Spurr and illustrated by Colleen Madden is exactly what you might expect it to be. It's a small board book that celebrates all the sparkles of Christmas and sparkly foil on the pages represent these times...from icicles to city lights--nothing is left out! The text is clever and rhymes and orients itself from the perspective of a young child. Children are sure to be delighted with the sparkling illustrations and will be provided with an additional opportunity to see the language of the holidays in use. 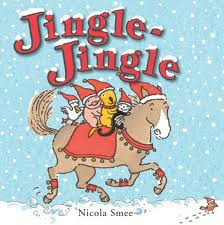 Jingle-Jingle by Nicola Smee would be the perfect board book to accompany every child's favorite winter song, "Jingle Bells" It's the story of Mr. Horse who takes cat and dog and pig and duck for a sleigh ride and they have many daring adventures. This is clearly designed as a book to use for young readers. The font size is quite large and the language is simple (consistently not complex for which it gets a star) and repetitive. This gives young readers' brains the chance to easily predict the text and rewards them with the experience of excellent reading. It is advised by me that you simply tell young readers the few unusual words, such as "swoosh" instead of forcing them to sound it out. Just tell them what it is and have them read it again. The story is quite cute to read out loud to children who cannot yet read. Also, it gets bonus points for being a wintery story not confined to Christmas, but still enjoyable at Christmas! 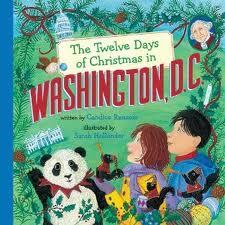 The Twelve Days of Christmas in Washington D.C. by Candice Ransom and illustrated by Sarah Hollander is great fun! This picture book is for older readers or read alouds. It follows Olivia who goes to visit her cousin in Washington D.C. What's so great about this book is that each page or gift of Christmas is something unique to the D.C. area. When Olivia receives the gift, she writes a letter to her parents to tell them about it. It's not at all dry but very educational and a lot of fun. These books are available for several different areas so it might make a great gift for a beloved child you know who doesn't live near you. 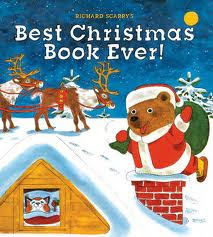 Richard Scarry's Best Christmas Book Ever is full of short anecdotal stories based on the characters in Busytown. The stories are very cute and funny driven forward by action and directives, like, Look it's...While I felt no particularly strong connection to this book, I know it's a popular series, and the illustrations are really cute. Additionally, the stories do foster a sense of the importance and beauty of community. 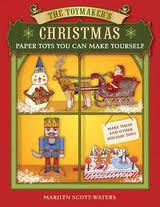 The Toymaker's Christmas Paper Toys You Can Make Yourself by Marilyn Scott-Waters is awesome. It has some simple paper toys you can fold and glue to make lovely little ornaments and decorations. I imagine many children would love to be occupied with this during the busy holiday seasons. The holidays do bring out our creative instinct after all! So take a break from baking cookies and do some young crafting! 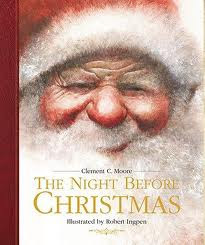 The Night Before Christmas by Clement C. Moore Illustrated by Robert Ingpen. Obviously I'm not going to review the classic poem that captures so much of our Santa Claus mythology but I do want to tell you about this because the illustration are gorgeous. They are beautiful, unexpected, and nostalgic. For each part of the poem, Ingpen focuses on one central aspect of that stanza. For example, to the opening stanza he has a mouse that takes up a huge portion of the page. (don't worry, it's cute) It's really lovely and would be the perfect edition to own if you don't yet have this classic in your library. What is your favorite picture book for the holidays?